Here's some "inside the designer world" discussion. I've been told there are knitters who won’t buy a pattern that has a low number of projects or good project photos, as they don’t trust the pattern. 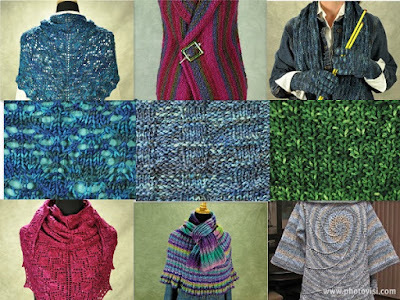 They say the more popular a pattern is, the more people who want to knit it. Popularity on Ravelry is measured by project numbers, photos, comments and forum discussions. Another designer recently told me she overheard a yarn shop owner tell a customer not to buy one of her new patterns because Ravelry isn't showing any projects. She was pretty upset about it and so am I.
I'm always encouraging people to "please, please, please post photos in Ravelry". Here's what my numbers tell me. I used five of my patterns in the shawl and garment categories based on sales in Ravelry and Patternfish. The range of projects to pattern sales is .02 to 2.8. I know when I ask, knitters they tell me they would rather be knitting than spending time on Ravelry. Last summer I offered a free pattern to any one who created a finished project page. I only had a few people take me up on the offer. I'm going to make the same offer again this year. I'm running it as a special promotion. From now until August 31 2016, if you post a project page with a photo of any of my patterns shown with a completed project, I'll give you a promo code for a free pattern. You can choose any of my patterns that are available on Ravelry. Just email me (my contact info is at the top of this page) give me the project page link or the details, your Ravelry name etc. I'll send the promo code to your email. Happy Knitting! Ravelry is such a mystery, so thanks for the insight. I figured it was something like that. People rarely upload photos of my projects. Gggrrr. Haven't had a Rafelry hit yet! Someday I hope. It also explains why I see my patterns selling better long after publication. I really don't understand the point of this article. I will buy a pattern that has the right design lines for my style. And if I see that it's been made by hundreds (Hitofude for example) I am turned off and won't buy the pattern. Who needs to make something made by the masses? I want my hard work to reflect my singular style and I don't need the approval of the crowd. I started designing for exactly the same reason. I want unique garments for myself. Now that I'm selling patterns I know that most knitters don't feel the same and those knitters are my customers. If I'm going to spend the time and money to produce patterns I want to at minimum earn back my costs. To hear knitters won't even look at my patterns without other projects is very disheartening. Especially for new patterns. Let me clarify: your design needs to speak to me directly. Your staging of your design is what sells me because it represents your clearest vision of your intention. I know my body type and what is best for me. If you have a design with raglan sleeves, for example, I won't consider it because that's not a sleeve design I will wear. It won't matter who made it and how good it might look on them - it's not best for me. I want every designer to have success and strong sales but no designer can meet the needs of every potential customer.